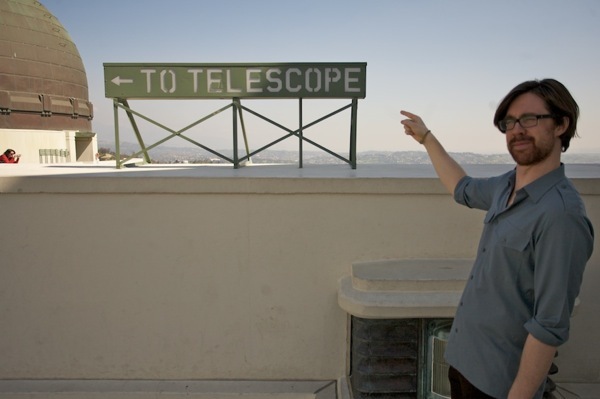 This is me at Griffith Observatory, Los Angeles. The photograph was taken by my friend Russell Sanzgiri, after an enlightening few days in California. I am an Associate Professor of Astrophysics, and researcher in the field of extragalactic astronomy at Stockholm University's Department of Astronomy and Oskar Klein Centre for Cosmoparticle Physics, Sweden. Various details can be found among my vitae. My research interests are mainly focussed upon galaxy evolution: how things like the Milky Way came into being and what was around before. This is supported by the Swedish Research Council (Vetekskapsrådet), the Swedish National Space Board (SNSB), and as of 2015 I will be a fellow of the Knut and Alice Wallenberg Fonudation. The approach is mainly observational, using data from the Hubble Space Telescope, ESO's Very Large Telescope, various other optical and radio telescopes. More (likely out of date) details may be found on the research. Should you be looking for something that you cannot find, or finding something for which you did not look, then get involved.